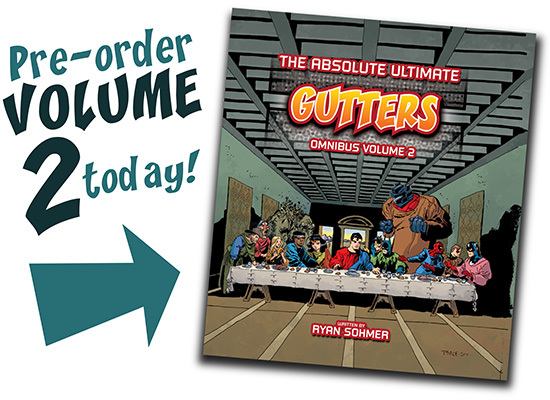 Before we do anything, it is my pleasure to announce to you that The Absolute Ultimate Gutters Omnibus Vol.2 is now available for pre-order! Featuring an amazing cover by the one and only Tim Sale, this second volume collects over 60 Gutters pages, as well as commentary, sketches and pretty pictures of us as superheroes. Also, the first 500 copies will be signed by the one and only Ryan Sohmer. So you will want to get on this ASAP! Convention season is an exciting season, though I don’t know if we can still call it a “season.” It starts in February and for us, it continues though October! Not even Major League Baseball has a season that long! Also, credit where credit is due. While we all take a turn behind the tables at various shows, Sohmer & Lar (and Becker when he’s not getting married) are tirelessly at every one of these shows. That’s a lot of planes, hotels and Red Bull. So, should you be at a show with us, do stop by for a Hello, a Hug and a game of Bingo! Have a great New Comics Day and we’ll see you back here Friday!